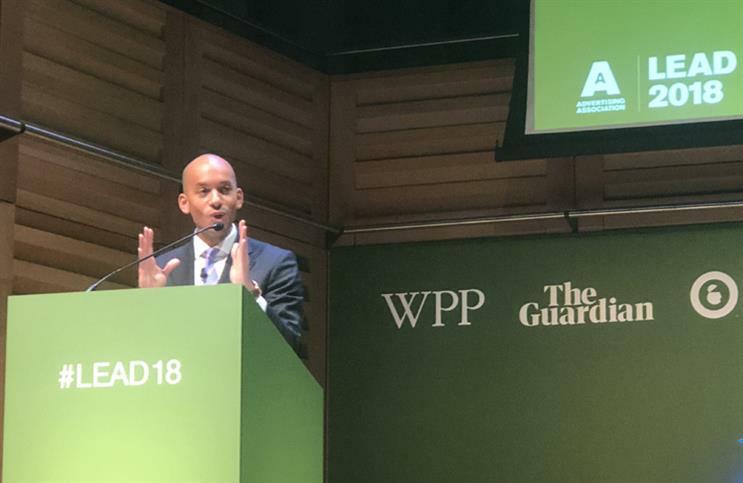 Conservative ministers are deliberately deceiving the UK public about Brexit, ardent remainer and Labour MP Chuka Umunna told senior ad industry figures at Lead 2018 today. While the majority of the country did vote to leave the EU, the referendum did not stipulate what Brexit would look like, Ummuna explained. "It’s becoming increasingly clear that Brexit, as sold, is not deliverable," he said, and asked later in his speech where the £350m a week for the NHS had gone. The first "great deception" the government has done, he said, is to portray Brexit as a single linear road with one destination we cannot slow down, stop or turn off. "That is simply not true. Last week, the president of the European Council Donald Tusk [and other European leaders] made it clear that the British people are in charge of this process. And there is no legal or political obstacle to Britain staying in the EU if we don't like the Brexit deal Theresa May comes back with." The second lie, Umunna said, is the denial that the "unsustainable negotiating red lines" Theresa May set out in her Lancaster House speech are severely hampering the ability Britain has to get a decent deal from this process. "Our EU counterparts have put a number of options on the table and our Prime Minister is ruling them out," Ummuna said. "For example, the single market provides tariff-free trade between countries and a common framework. EU countries come together through the customs union and apply the same tariffs to goods from outside the union. That is why being part of the EU has been such a success. Now, non-EU countries can participate in both these bodies and doing so is the best way to retain the economic benefits of the EU membership while being outside." According to Ummuna, May took these options off the table before negotiations began to appease the hard-right Tory party. The third "great deception", the MP for Streatham went on, is: "That we can have the same economic benefits outside the EU that we had when we were inside." "We are not going to be able to. The government is labouring under the misapprehension that we can secure a free trade deal outside the single market that will cover not just trade, like the deal Canada has, but also service. France's [president] Macron has been clear that this is only an option if we remain in the EU. We cannot have our cake and eat it," Ummuna said. A recent poll by BMG has found that 57% of Brits want a second referendum if Theresa May fails to secure a deal, and 55% now want to remain, he pointed out. "I don’t understand why the government doesn’t listen," he said and later added that the government should leave the door open to letting the people have the final say. Finally, Ummuna said that it is a lie that the EU wants to punish the UK, to make the nation an example to prevent others from leaving, and is therefore preventing the nation from getting a custom agreement. "Although Theresa May and her ministers keep talking about a deep and special partnership with EU and for the deal, the cabinet has not set out what that looks like. They can’t agree. Liam Fox is here, Philip Hammond is there, God only knows where Boris Johnson is," he said. They are not acknowledging that May triggered Article 50 without working out these details and now, there isn't time to put one together, he continued. "It's an obstacle of Theresa May's creation. Not the EU. I'm not saying the EU is perfect, but let's get real." While generally, businesses are reluctant to get involved with politics, this time the political is commercial, Ummuna said. "It is linked to your company's futures. This is an industry that is renowned throughout the world for its excellence and creativity. You must spell out what you need the government to do for you to achieve growth post-Brexit," he urged.